Novella #2. June of 1903. This book opens with my astonishing account of the origins of the Byblos Foretold phenomenon, and then resumes where the first novella left off. As Lord Timothy Dexter’s entourage of faux aristocrats makes its way to Byblos, the small upstate New York city he calls home, we are introduced to a new set of characters. There’s Greta, the erstwhile Greenpoint jute-winder and casual prostitute; Jack, a knockabout street urchin with a keen grasp of market economics; Pat and Danny Lyons, identical twin swindlers who together make for a useful literary device; Corporal Trim, a veteran of the gruesome Long Island campaign who’s willing to tell the tale—and then some; Jane Jebril, a parlor house madam possessing all the requisite traits; Tillie, Lord Dexter’s affection-deprived wife, who for now manages to keep a lid on her libido; their accommodating daughter Felicia, who isn’t similarly inclined; and last, Felicia’s fiancé, the inconveniently married Arthur Biddle, whose arrogance and outsized self-regard rival those of his wife. Now that they’re assembled, take a hogshead of deceit and add a jigger each of rum, love philtre, and whichever bodily fluid suits your mood. Mix thoroughly and serve. My dearest, most gracious reader—before we rejoin the story proper I must beg some time alone with you. I have too long put off revealing what is, perhaps, the most extraordinary element of this most extraordinary saga: its origin. The only excuse I can offer is that I thought it wise to wait until we were thoroughly acquainted before putting your trust to such a test. And tested it will be, for the tale I am about to lay before you is so utterly fantastic, a less devoted companion might be excused for doubting it. Some time ago, when we were all sailing aboard the S.S. Kronprinz Wilhelm, I mentioned that my role in this endeavor was that of assembler. I shied from taking the title of editor because I’d hoped to be able to limit my interventions. But, alas, that has not been the case. Though I have every reason to believe that what I’ve laid before you is a true and, primarily, honest account, the disparate sources on which it is based are simply too contradictory for any one to be followed blindly for even the shortest period of time. I suppose, beleaguered reader, it must seem to you as if I’m speaking in riddles. But have no fear, I’ll not string out my story like some eighteenth-century sermonizer enamored of his own conception. Early one frigid morning in February, 1903, I was returning to my apartment after a long evening spent with friends from college. I was living then, as now, in Brooklyn, right above Prospect Park, and had just left the streetcar as it rounded the plaza. Not surprisingly on so bitterly cold a night, I saw no one about, and, once the streetcar had gone, heard nothing. The sky was clear and a full moon illuminated the monument that dominates the plaza. Until… until it did no longer. I looked up and saw silhouetted against the starlit sky a slow-moving leviathan. In time, I recognized it for what it was—an airship of gigantic proportions. I was, as you can well imagine, struck dumb in awe. The ship was dark, charcoal grey, and silent as the grave. It slowed further, and a minute later, halted entirely. Then, suddenly, a beam of light shone down into the park. I suppose the inhabitants of the Earth can be neatly divided into two halves. Or, let us say the Earth’s population. Otherwise, it might sound as if I’m suggesting the planet’s inhabitants be cleaved each in their turn. And what a laborious enterprise that would be. There are those who, on seeing a beam of light streaming from a silent airship hovering over a cold and friendless city, flee to the safety of their homes and wonder who to telephone. And then there are those who overcome their apprehensions and venture forth into the unknown. I, happily, count myself among the latter. Some two hundred yards into the park, I could see where the beam reached the lawn. Then, as suddenly as it had appeared, it went dark. It had been eclipsed by a parachute, which drifted slowly downward until finally hitting the ground with a thud. Soon after, the beam was extinguished and the airship proceeded on its way. Gingerly, I approached, and there, beneath the folds of the silk parachute, I found a wooden crate. The impact had detached its lid, and I could see that it held a collection of documents. I picked up one sheaf which was bound with a ribbon and brought it to a nearby streetlamp. What I read shocked me to the very core of my being. I took up as many of the documents as I could carry and rushed to my apartment. Once I deposited those, I went back with a satchel through the still-empty streets. It seemed that I was the sole witness to the visitation. After filling the satchel with what remained, I returned home to spend a sleepless night examining my trove. Nineteen hundred and fifty-nine! Some fifty-six years into the future. When I opened the bundle and began reading, I received a second shock. The author, whose married name I will reveal when the time is ripe, explained that she was committing her biography to paper for the benefit of her grandchildren. She began, naturally enough, with the date of her birth: May the seventh, 1903—some three months after the arrival of the airship! The next day, there were accounts in several of the New York papers from others who’d observed the airship. But similar sightings had occurred with such frequency over the previous decade that no one was wont to believe them—the patronizing journalists expressing their incredulity with the barbed sarcasm which comes so easily to them. Having no interest in exposing myself to their sharpened nibs, I kept silent, and fully expected to hear no more about it. But the affair’s final act had yet to play. I was just finishing my lunch when the janitor came to the door. An assistant superintendent from Prospect Park had sent round a wooden crate. In his accompanying note, he conjectured that the crate had been stolen off an express wagon and that the thieves had abandoned it in the park on finding nothing in it but a large quantity of silk. It was, of course, the same crate from my encounter the night before, with the parachute neatly folded and laid inside. The lid had now been carefully reattached and on it was—prepare yourself, O constant reader, for yet another test of your trust, for on it was written my own name and address! It all seemed so improbable. And yet, one explanation, or partial explanation, had come to light that morning while I was reading the life story of Eugenia. Midway through it, I came to a realization: I knew her parents. I should tell you now that in the story as I’ve been presenting it, I’ve changed most of the names, including Biddle and that of the city, Byblos. But not Eugenia. The choice of that name—from the Greek for well-born—so exemplifies her mother’s character that I thought it irreplaceable. I have known Eugenia’s mother since college, but for some time we have not been on the best of terms. Why her unborn daughter would send me her autobiography is a question which will likely never be answered. Or at least not before 1959, by which time, apparently, options for shipping parcels will have increased markedly. The memoir itself comprises several bundled manuscripts. But also written in Eugenia’s hand are several other works, which I assume to be literary efforts. These I have set aside for the present so as to concentrate on the family history. Now let us turn to the other documents contained in the crate. Eugenia describes these as her source material, which she has used to augment her own recollections. I have examined them all, and by relating their contents to events and persons described by Eugenia, I believe I can now identify most of their authors. The text which begins earliest is the two-volume journal of her mother. This she kept sporadically, and even then only between the fall of 1902 and the spring of 1905, when it ends abruptly. It is written in an off-putting style, all in the present tense, with its author speaking at the reader like the deity she believes herself to be. Next is a volume by her mother’s retainer, whom I’ve christened Mélisande. It relates a number of ribald anecdotes, all told in a frank, unschooled voice and utilizing what appears a random assortment of French and American slang. These tales, she tells us in her prologue, were written for the edification of her “little sister,” Eugenia. And to ensure that the lessons are clear, each ends with a pair of amusing morals. Some of the more developed of these tales are reminiscent of those found in Boccaccio’s Decameron, and some of the more earthy, of the medieval fabliaux. Then there is an autobiographical sketch by Lord Dexter’s secretary, Tomasz, who seems to have suffered from an acute form of introspection. If the resulting bathos were intentional, this might be thought the flawed work of a genius. But that would be a difficult case to argue. It isn’t clear if this overwrought manuscript was written from memory or contemporaneously with the events it depicts, but I can’t imagine why anyone would care. The fourth item is a treatise by Lord Dexter himself, printed in Byblos at his expense and plainly meant as a sequel to his better-known relative’s book, A Pickle for the Knowing Ones. It’s a paragon of circumlocution, written in a state of confusion, and laced with vitriol throughout. Dexter himself calls it a “lit’ry gallim’fry” and I defer to his appraisal if not his spelling. No less odd than its contents is the binding: there is none. The pages have been purposely left loose and unnumbered. So what constitutes the beginning and what the end is a matter open to conjecture, particularly since it makes as much sense—or as little—in whatever order the pages are read. This volume—A Pickle Salad for the Know-It-Alls, May Ye Choke on It!—is indeed aptly titled. The next three pieces are manuscripts authored by individuals not yet introduced in our story. The first is written by a hyper-omniscient narrator who’s given over to what Mr. Ruskin called the pathetic fallacy. In her telling, insects suffer angst and furniture flinches. Though the authoress is one of the principals in Eugenia’s biography, her own account may be too whimsical to be of much use. The second is a piece by another woman, written—if it is to be believed, and much of it begs credulity—sometime in the 1920s. Though she touches on many of the other characters, her chief concern is herself, and her own evolution from a dreamy adolescent sensualist into a very determined sybarite. The early part of it will be quite useful, but the later part seems nothing more than salacious fantasy. No one, save those of the most prurient curiosity, would wish to be exposed to it. But, then, one never knows…. Last is a very long letter dated 1931 and addressed to Eugenia. It was written—or, I suppose, is to be written—by a Roman Catholic priest well acquainted with her mother. The most erudite of all these sources, it fills in many of the voids left by the others—though, again, its reliability is questionable, its author having a reputation that invites doubt. Also included were such things as ships’ logs, the significance of which I have yet to determine. And scattered amongst all these were newspaper clippings, photographs, and other mementos—most undated and lacking inscriptions. Which leads me to the final item: a collection of objects which Eugenia refers to as the Greta-paedia. It consists of a scrapbook fashioned from a bound volume of waltz scores and a small wooden box. The text, such as it is, is made up of primers, pamphlets, patent medicine almanacs, and dream books, either found complete in the box or dismembered and pasted into the scrapbook. These were meant, I assume, to provide guidance or instruction. The scrapbook also contains pictures from magazines, tradesmen’s cards, and a variety of natural curiosities, and is quite thoughtfully constructed. A labor of love, surely, but one which gives new meaning to the term higgledy-piggledy. In her autobiography, Eugenia makes clear that she has utilized these earlier sources in order to create the most accurate account possible. But has she? No. No, I think not. In fact, I would go so far as to say she is that most taxing of companions, the unreliable narrator. I base this charge on two pieces of evidence. First, I know from personal experience her characterization of her mother to be demonstrably false. In her telling, her mother is an intelligent and attractive woman, but no more vain than is the norm of her species. I concede the first two points, but the last is utterly ridiculous. This woman is the very quintessence of vanity. And deceit. Why doesn’t her daughter make mention of that, I wonder? Well, the benevolent reader asks, mightn’t we forgive a child her biased opinion of her parent? Forgive, yes. But not excuse. And what about the second bit of evidence? This is perhaps the more damning of the two: she frequently overrules the firsthand accounts found in the other documents. For instance, her account of the sojourn in France and the nature of the voyage home, when she was just a weeks-old infant, bears little to no resemblance to that found in her own mother’s diary! After reading Eugenia’s bowdlerization, I had concluded that hers was a normal, if somewhat eventful, life, peopled by normal, if somewhat colorful, characters. Of interest to her family, perhaps, but few others. However, after surveying the underlying documents themselves, I realized I had the makings of a grand epic. All that was needed was the hand of an experienced wordsmith. What’s more, I believe Eugenia herself came to this conclusion. For who but her could have sent the archive to my doorstep? I bow to her judgment. For there seems little doubt that I, and I alone, am in a position to set this great work before the learned public. Where the sources contradict one another, I will endeavor to play the honest broker. And when, for the good of the entertainment, certain events beg elaboration, or truths need bending, I will not dither over trifling obligations or misguided fealty. For first and foremost, my loyalty abides with what I know to be the essential truth of the story. 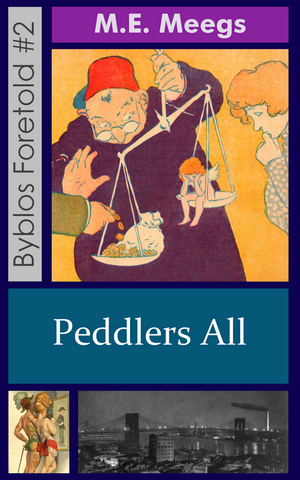 If you find the anticipation too difficult to bear, you’ll be relieved to learn that this second novella in the series, Peddlers All, is on sale and awaits your pleasure.